The Lady Clarets celebrated winning the North West Womens Regional League Premier Division title and promotion to the FA Women’s Premier League Northern Division One after a 4-0 win against CMB of Bolton on Sunday. This season’s historic run in the SSE Women’s FA Cup and the title win end an 11-year barren period in major competitions for Burnley FC Ladies, and propels them onto the WPL stage. The team now play under Burnley FC in the Community management and are greatly benefiting from focused training and tactical game play, which will hopefully herald the start of a new era of achievement. In contrast, CMB approached the game at the end of a difficult season, but were determined to put on a competitive performance in what may be their final game. In the event, they competed well and counter attacked in the early stages of the game, with their player of the match Anna Brodie retaliating with shots at the Clarets goal after Sarah Greenhalgh, Lizzy Hamer and Leah Embley had all tried their luck against the CMB keeper. The Clarets’ breakthrough came on 10 minutes when Holly Hunter made a trademark run from her defensive position and delivered a pin point cross from the right wing. Greenhalgh jumped high and headed firmly at goal, hitting the cross bar, but the ball bounced back for her second header, which she directed into the net towards the left-hand post. The Clarets had to work hard to ensure they maintained the advantage, and were soon awarded a penalty when Leah Embley tried to cut through the visiting defensive line and went down. The referee awarded the penalty kick against the protests of the visitors. Justine Wallace stepped up and slotted the ball into the net, close to the left-hand post. The Lady Clarets breathed a sigh of relief, knowing that the two-goal cushion would be difficult for CMB to overcome, though the score remained unchanged at the interval. Soon in the second period, CMB were once again on the receiving end of a penalty decision. This time there was no doubt that a defender had flipped Greenhalgh to the floor in a late tackle. Greenhalgh elected to take the kick and neatly tucked the ball inside the post and well out of reach of the keeper to make it 3-0. CMB battled on and had chances to reduce the deficit. Clarets keeper Lauren Bracewell forced a striker to shoot wide when she found a way through the Clarets defence, and later a clash of heads between a striker and Bracewell resulted in an injury for the striker. CMB were without substitutes so she played out the game. A final goal for the Clarets resulted when a forced clearance from a Lynette Craig cross was collected by left back Vikki Eastwood, who chipped above the visitors’ defenders into the top corner. At the full time whistle it was job done for the Lady Clarets, who had achieved the necessary points to guarantee the league title. The fixture had been designated a double header by the league, meaning a second 60-minute game between the two teams should be undertaken on the same day to conclude the season’s fixtures. In the event CMB had too many injuries and elected not to play. The season is now designated as closed so the game will probably remain outstanding as it would have no effect on either team’s end of seasons standing. Next season the Lady Clarets will encounter tough opponents game after game at the new level. They have already proved through their FA Cup run that they can compete at higher levels, and so are already looking forward to the challenges ahead. 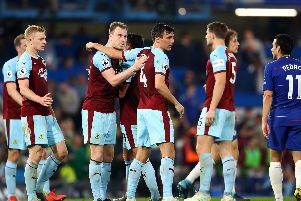 The team will take a well-deserved rest when the celebrating subsides, and pay thanks to Matthew Pounder, their assistant manager and Head of Sport at Burnley FC in the Community, who initiated the changes that have structured the team for its current success. Matthew is leaving his role at Burnley FC in the Community to take up a football disability role at the FA in London.